Folio's platform is designed with your fiduciary obligations in mind. Everything about it, from window trading to model management, supports your fiduciary responsibilities, including the ability to customize portfolios to the client's unique needs. Equitable price execution: All trades in a ticker in the same window are executed at the same price. Commission-free trading: Folio's commission-free window trading means you can serve your clients as needed, with timely rebalances and new investments, changes to preferences and risk levels, and more, all without the constraint of commissions or transaction fees. Low-cost model management: Folio helps you reduce your client's fees and avoid the embedded expenses of funds and ETFs through construction of your own models on our platform or use of our no-fee, fully customizable Ready-to-Go FoliosTM. Shedding light on fees: Clients know exactly what they are charged with compliant advanced billing notices. Client access: Your clients can readily view their holdings, performance, account activity, balances, statements, and tax documents through Folio's client portal. Leveraging tax strategies: You can better manage tax results for clients with our automated tax management tools and our patented TaxFootballTM. Learn more about how we can help you meet your fiduciary responsibilities. The advisor dashboard is your practice management command center. Search, filter, and sort data in ways that help identify possible issues quickly, uncover client trends, and discover new opportunities. The dashboard delivers a comprehensive set of client account data collected from all areas of Folio's books and records, consolidated and accessible from a single view, and exportable as well. More than 70 specialized, customizable widgets are grouped into categories to make it easy to find the information you need, such as accounts, clients, transactions, holdings, models and allocations, orders, deposits, withdrawals, transfers, and assets held away. To make getting started easy, the dashboard comes pre-configured with several layouts designed to support common practice management activities. You can tailor the layouts by adding and deleting widgets and by choosing from hundreds of optional data elements. See how to customize the advisor dashboard for your needs. Folio helps you manage the tax impact of client investments. Create and manage automated tax strategies to satisfy each client's own needs. 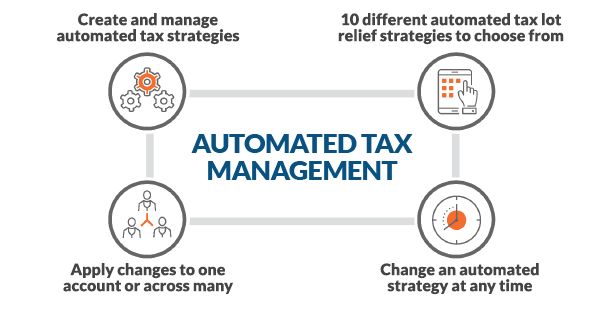 Select from 10 different automated tax lot relief strategies—and every trade for that client follows that strategy, automatically. You can change an automated strategy at any time, even on a trade-by-trade basis. Our patented Tax FootballTM helps you obtain the tax results you want. Our "football" shaped graph represents the maximum taxable gains and losses that can be realized for a specific amount of cash proceeds. Simply enter your tax objectives—a gain or loss amount, short-term or long-term gains, or no tax impact at all, desired cash proceeds, or security exclusions. Then simply place the trade to realize that objective or review the tax lots to be sold to further fine-tune the results. The Tax Football lets you provide a very high-end tax service in just a couple of clicks. Make tax season easier for your clients with Folio's comprehensive tax center. We provide completed IRS Forms 1099 and 8949 for your clients, securely stored and accessed from the Folio Client portal. Download both realized and unrealized gains and losses in .csv format. Clients can export Folio account data directly into popular tax reporting software from Intuit's TurboTax® and H&R Block's Tax Online. Folio's powerful API services give you control over the functionality and user experience of your website. For those with the interest and the technical resources, our APIs let you leverage all the power, features, functions, and benefits of the Folio platform, but within the look and feel, branding, navigation, user interface, and functionality of your own website. For financial technology companies and financial institutions, our API Services allow for complete customization and integration. We make it easy to exclude investments in individual securities, sectors, or industries from one or more client accounts. We even have social issue filters that let you reflect clients' social values in their portfolios. You can apply these exclusions to any number of accounts and provide completely customized exclusions as well. Security Exclusion: Simply enter the security symbol of any individual securities you want to exclude from an account—especially useful for clients that work for a publicly traded company. Sector Exclusion: Use our sector-exclusion tool if a client is too concentrated in one or more sectors or is seeking to better diversify by investing in other sectors. Want additional exclusions or filters? Let us know. Create your own blended benchmark or select a benchmark to automatically display on your client's performance graphs. You (and your clients) can review account or individual portfolio performance, as well as view relevant portfolio statistics, such as beta, sector breakdown, P/E ratios, dividend yield, and much more. Leverage automated billing modules to increase efficiency and reduce overhead costs. Create up to 10 billing plans based on client or account, monthly or quarterly, and forward or arrears billing. You can even do a combination of automated and manual billing. Clients can receive advanced billing notices as well as the final billing statement, all handled by Folio. Launch a web-based advisory service that automates account onboarding, reduces client-servicing costs, and provides 24/7 access with Folio Advisor ConnexionTM. Customize a mix of online and in-person advice, allow clients to perform tasks online, and even set up a self-directed, advised offering through this modular suite of services. With Folio Advisor Connexion, you have complete control over clients' investing strategies and can address their changing investment needs over time. Control Client Investments: Automate time-consuming client onboarding tasks and focus instead on providing personalized investment strategy and retirement planning services. Access to New Client Segments: Scale and broaden your business by supporting clients with fewer investable assets and those who are less interested in the traditional advisory model. Grow Your Business: Eliminate traditional geographic and time-zone barriers and expand your practice more easily using Folio Advisor Connexion's automated onboarding and client management services. With Folio's powerful online technology, clients can open new accounts and manage their accounts 24 hours a day, 7 days a week. Reduce Back Office and Operational Costs: Folio Advisor Connexion eliminates tedious and error-prone manual and paper-based account set-up and activation, reducing the work, complexity, and risk associated with client onboarding. With Folio Advisor Connexion, you can capture new client assets faster and more efficiently. Folio Advisor Connexion is available as a customizable, co-branded, turnkey offering, or it can be implemented as a white-label solution using our APIs to give you complete control over the look and feel of your website. See Folio Advisor Connexion in action.